The Honor 7 Lite (5c) has a 5.2" IPS LCD screen of 1080p resolution. On paper, it's the same as the P9 lite screen. It turns out, however, that this is not the case. The screen offers decent image quality, but it's let down by contrast - it's much lower than that of the P9 lite's screen. It gets even poorer when you view the screen at an angle too. 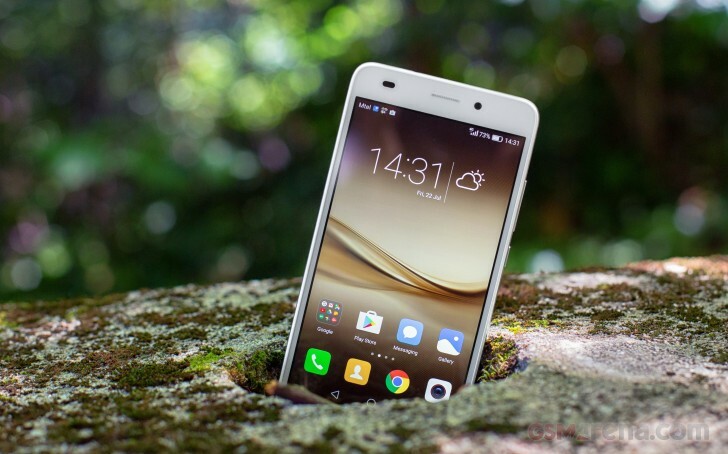 The Honor 7 screen offers average brightness, somewhat below the P9 lite. However, its black levels are higher, which has a negative impact on contrast and you can really see black backgrounds in apps glow in the dark. The sunlight legibility takes a small hit compared to the Huawei P9 lite, but it's not as big as the difference in contrast suggests. It tops last year's Huawei P8 (both the flagship and the lite version) and some of the competition, matching most others in its price bracket. On the plus side, the color rendering is surprisingly good. The default color mode has the white balance a little too cool, but it offers an average deltaE of 6.7 and a maximum of 12.9. These are better than the defaults on the P9 lite. The screen can do better when you switch it to Warm mode. The average falls to 5.3 and the maximum to 9.6, comparable to the Xiaomi Redmi 4s and Lenovo Vibe K5 Plus. This is a very good result for the price. You have a fine-grained manual setting too, so you can get a color balance that looks best to you (in case Warm doesn't quite cut it). The Huawei Honor 7 Lite (5c) is a dual-SIM phone with LTE connectivity. It's Cat. 4 (150Mbps down, 50Mbps up) instead of Cat. 6, but that won't make much of a difference on most carriers. The phone gets solid reception thanks to its dual antenna system. It automatically switches between the two to reliably hold on to signal. Local connectivity includes Wi-Fi b/g/n, without 5GHz or ac support. We don't miss ac as much as the 5GHz as apartment buildings often have a congested 2.4GHz band, which can lead to poor connectivity. Bluetooth 4.1 with Low Energy and NFC are also on board, there's even an FM radio. There's a microUSB 2.0 port, but that's only for charging and data transfers to a computer. USB OTG is not supported and neither is wired TV out. The Honor 7 Lite (5c) has a 3,000mAh battery, great for a 5" screen. Better still, its Kirin 650 chipset is built on an efficient 16nm process, just like flagship chipsets so its power efficiency should be great. And indeed, an Endurance rating of 75 hours is great at such an affordable price point. It drops a few hours if you use two SIMs, but you can still get up to three days between charges with moderate usage. Talk time has improved compared to the Huawei P9 lite (the Honor 7 Lite has a different modem), though the other two ratings have taken a hit. We guess that it's the different screen to blame for losing two hours of web browsing and one of video playback. Even so it remains competitive against midrange 5-inchers, including ones in a higher price bracket. Battery Manager is part of the Phone Manager and includes a selection of three power plans with a varying degree of limiting certain phone features. From here you can also control which apps can remain active after you send the phone to sleep and an estimate of how long the phone is expected to last in each mode. The most frugal Ultra power saving mode essentially turns the Honor 7 Lite into a feature phone (but more than doubles the expected battery life).